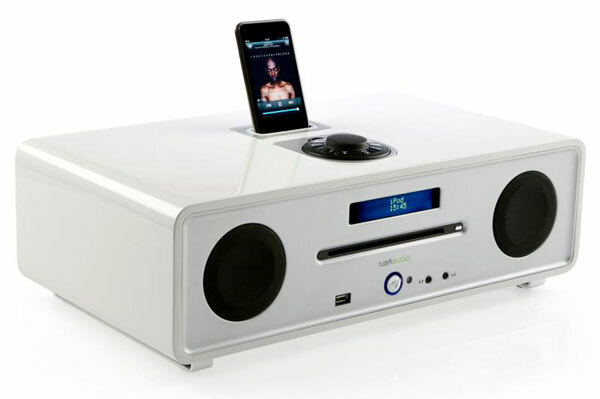 This premium music system may be pricey, but it’s a genuinely top-notch wee beaut. RUARK AUDIO’S PAYOFF line is ‘Serious Small Audio’, and the R4i makes a compelling argument that it’s a serious piece of kit. This thing is built like a small tank. At 8kg, it’s a solid piece of gear but in the Dream White finish, it’s also a curvaceous knockout – the gloss white matches nicely with the black drivers and the matt silver highlights. The R4i makes a restrained but very serious statement from the moment it’s brought out of its box (it even comes in a soft cloth drawstring bag to protect the finish). This isn’t exactly a brand new product but it’s been heavily updated since it was first released; it’s new to New Zealand and has been getting good reviews and winning awards internationally, so we decided to have a look and a listen. Unlike the R2i (reviewed here), the R4i has a slot loading CD player and it’s a much bigger device, with four times the power (80 watts vs. 20) and an active downward firing subwoofer (it’s a woofer, but let’s not get too pedantic). There’s also a front mounted USB port, along with two selectable aux inputs – one front mounted 3.5mm and a rear mounted RCA, which sits next to the RCA line outputs. There’s an iPod dock on top, which is the old 30-pin version – for my thoughts on the whole 30-pin vs. Lightning connector issue, check out the R2i review at the above link, I won’t rehash it here except to say forget about docking your iPhone 5. There are also FM, DAB and DAB+ tuners along with clock and alarm functions and a 3.5mm headphone jack to round out the capabilities of the R4i. While there’s no Wi-Fi or Bluetooth, this isn’t really that kind of music system, so it isn’t an issue. The R4i’s display isn’t the big bright one from the R2i. Rather, it’s a slender version that is easy to read close up but impossible to read from across the room. The clock isn’t on show all the time either, but the display is far more discreet and more in keeping with the nature of the R4i. The cabinet is amazingly “dead” despite being so stylish – give it a thump anywhere bar the metal front panel and it sounds as if you’re knocking on a solid wooden table. 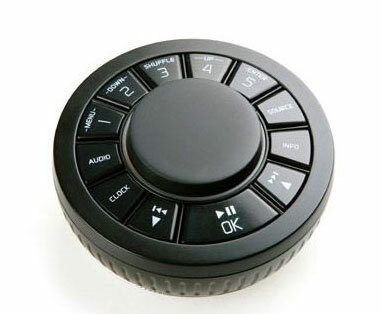 The R4i uses the same circular control panel as the R2i, complete with the jog-wheel that isn’t a jog wheel, but in a major departure from its smaller sibling, the R4i’s control panel pops out of the top of the unit and becomes an extremely cool remote control. This is a neat innovation worthy of the great innovators at B&O and it works like a charm, fitting nicely into the hand. When it’s not in use, it just pops back into its recess. If it were backlit, it would be even better but that’s getting a bit picky. I really like the remote but if it briefly goes AWOL, as all remotes tend to do, or even if it’s just on the other side of the room, then the only operational controls on the R4i are the power and CD eject buttons, which gives a whole new urgency to the “Where’s the damn remote?” question. This isn’t a big deal; keep an eye on it or leave it on the coffee table and you’re golden, but don’t lose it or you basically own an expensive but lovely paperweight. The R4i also doesn’t ship with any Apple adapters for the universal dock. I found this annoying on the R2i but at this price point, the omission is nothing short of infuriating. Before I listened to the R4i, I turned off all the audio ‘enhancements’ but I got a sound that was on the thin side, missing some bottom end heft. The Ruark engineers have been clever enough to fit a knob on the back of the R4i, which adjusts the output of the woofer (something Samsung’s engineers need to consider on their DA-E750 wireless speaker system). A tweak of this control went some way to getting the tonal balance sorted, but it was only once I enabled the Loudness that the R4i’s sound showed that Ruark has nailed this system – the R2i sounded good but the extra power, bigger cabinet and the added bass weight of the woofer give the R4i an edge over it’s smaller sibling. Bizarrely, the R4i sounds better with Loudness on, while the same setting didn’t do the R2i any favours at all. The R4i is a musical and pacey device, capable of a surprising degree of clarity and delicacy and easily able to distinguish between the production values of different recordings. While the overall tonal balance leans a little toward the bright side with a hint of splashiness at the top on certain recordings, this lends the sound an element of excitement and the R4i never sounds lean, thanks to the extra weight of the woofer. Set up on top of my SACD player at the front of my room, the R4i had no trouble providing a big sound with a decent enough soundstage, considering the size and layout of the unit. CD playback was clear and enjoyable, as was the sound of good quality files from a docked iPod Classic. The R4i’s FM reception is good, even better than the R2i’s according to my ears, despite the tuner modules likely being one and the same across both units. It takes a couple of nudges of the Info button on the remote to access the signal strength meter, and while it’s not as sensitive as the R2i’s, it’s a handy guide to getting the best reception and once that’s sorted, FM broadcasts proved to have lots of weight and atmosphere. A female friend of mine visited my place one day while the R4i was set up on the lounge table. She thought it looked amazing, loved the detachable remote and approved of the whole idea of this kind of all-in-one system. On the other hand, she couldn’t have been less interested in the pile of hi-fi gear at the other side of the room, regardless of what I had to say about the comparative sound quality. That tells you most of what you need to know about the appeal of the R4i vs. a component based hi-fi system.